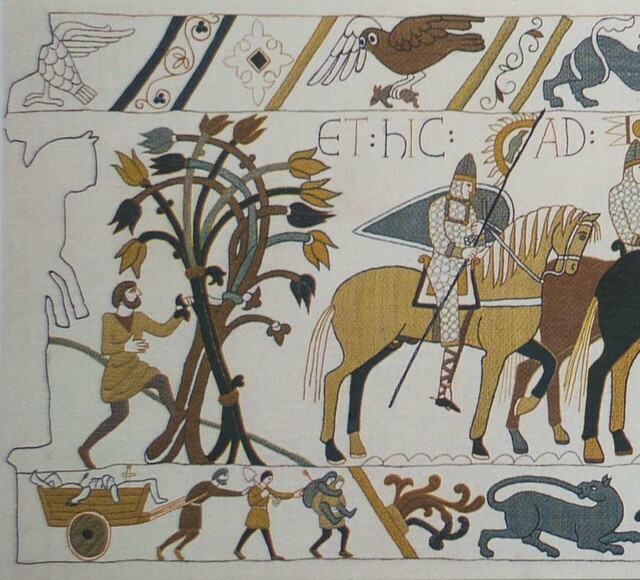 What is the "Bayeux Tapestry Finale"? It's a reconstruction of the last missing eight feet of the Bayeux Tapestry which was torn off at sometime during its 900 year history. The torn-off line can be seen at the extreme left of the panel. The scale is exactly the same as the original piece, which is over 230 ft long, and the format, materials, style and colour have been carefully matched to make a coherent ending. 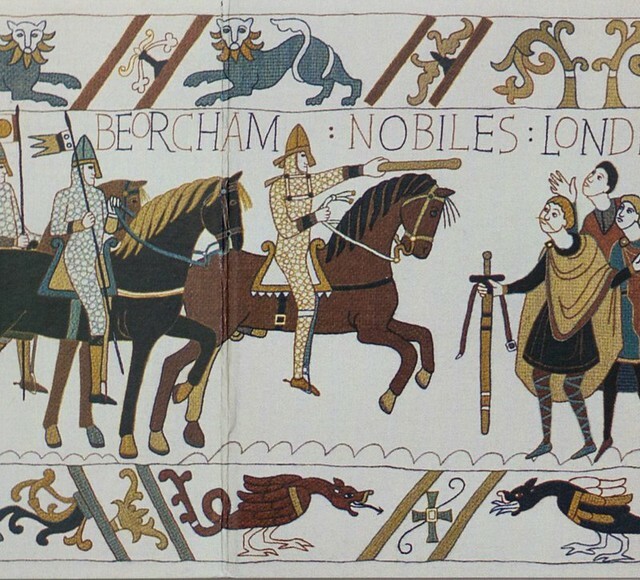 The scenes represent the mounted Norman army, led by William the Conqueror, meeting the nobles of London and Berkhamstead, where they offered him the keys of the city. 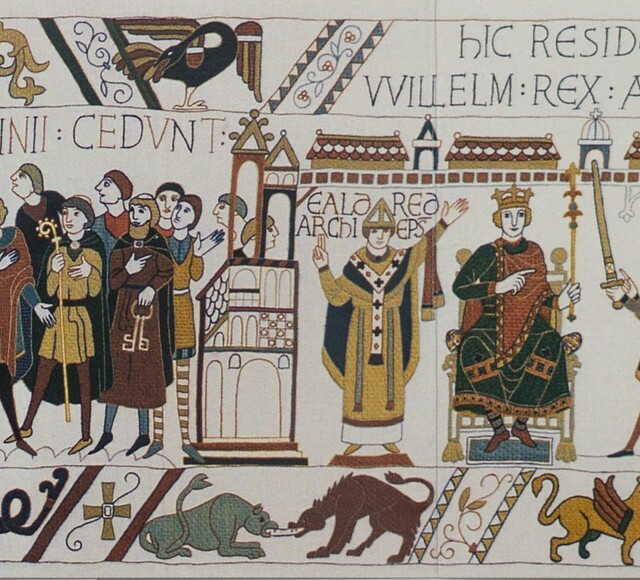 The expressions on the faces of the English people on the right of the scene contradict the legend above the figures which says that "everyone rejoices". Later on, the coronation of William takes place in Westminster Abbey in 1066, which historians believe is what would have been seen on the part that is missing. The fact that it was worked on a frame resting on trestles, just as the original would have been, was instrumental in teaching me a great deal about some of the anomalies in the original and about the differences in the borders. The embroidery (not truly a tapestry at all) was made in eight or nine sections and, if one compares the borders of these sections (i.e. between the joins) one can see quite clearly that different groups were at work, just as groups nowadays sometimes work on sections of large projects. This led me to re-think the usual theory that it was made in one place. It is a fact that, out of a only a possible nine existing English nunneries in the years immediately after the Conquest, seven of them were within a day's horse-ride of each other. The abbess of Winchester was probably a new Norman abbess whose eagerness to collaborate with Bishop Odo of Bayeux (half brother of the new Norman King, and the man who commissioned the embroidery) could be taken for granted. Also, at the nearby nunnery of Wherwell, the abbess was the sister of King Edward the Confessor, and at Wilton Abbey was his widow, King Harold's sister, both of whom would have had an interest in helping to depict the event that so re-shaped their lives. There was no nunnery at Canterbury at this time and, in an era when only women embroidered, it is difficult to understand why so many historians cling to the idea of there being a workshop there when no evidence of this has so far been produced. Similarities of style in the illuminated manuscripts belonging to Canterbury are not enough; there are just as many similarities (known as the Winchester Style) in those belonging to the two monasteries in Winchester. To strengthen my point, the 10th century nunnery at Winchester (the Nunnaminster) was the source of a hugely important tradition of skilled embroidery, some of which can be seen in the crypt of Durham Cathedral and now known as “The Durham Vestments”. The fact that Bishop Odo was given eastern Kent by his brother does not mean that he spent all his time there, as he acted as regent for his brother while William was for much of the time away in Normandy. This would have required Odo to be in Winchester where the new royal palace was being built. It is this palace that I believe he intended to be the original venue for the long hanging to be displayed all round the great hall, with words on it to avoid any misunderstandings. It would have fitted perfectly at eye-level, seen by everyone of importance, lit from the windows above it. For more on this subject, read “The Bayeux Tapestry Embroiderers’ Story”. Where can “The Bayeux Tapestry Finale” be seen? It is now hanging in the atrium of the James Cook Memorial Teaching Hospital in Middlesbrough. England. Anyone can go and see it. Will it ever join up with the original? No, this was never intended to be its purpose. Several other embroiderers have worked their versions of this subject, but the original in Normandy is quite unique and well worth a visit. 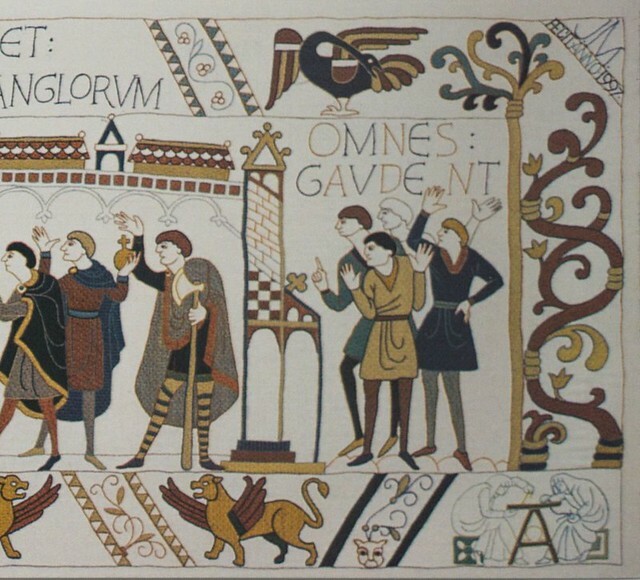 There is also a wonderful complete facsimile of the Bayeux Tapestry in the Museum at Reading, in Berkshire, worked in the late 1800s by the ladies of the Leek Embroidery Society. It is on permanent display. Another interpretation of the last missing length of the Bayeux Tapestry was completed by the people of Alderney in the Channel Islands, masterminded by Kate Russell. This actually spent its first summer next to the real thing in Bayeux. Wow! Scenes from the Alderney version of the Bayeux Tapestry Finale were used on a set of postage stamps produced by the Guernsey Philatelic Bureau. Comparisons with the Jan Messent original version show distinct similarities, which I was pleased to permit.